Don Wallace, New Zealand Tree Grower November 2017. 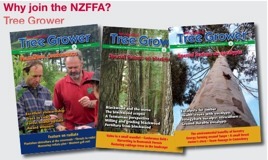 The Forest Resources and Environment Committee, commonly known as the Environment Committee, is one of several joint NZFFA/NZFOA committees funded by the Forest Growers Levy. It is chaired by Peter Weir of Earnslaw One. 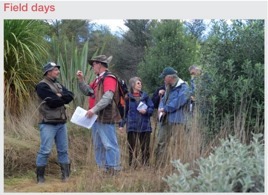 This committee began as part of NZ Forest Owners Association committee structure and, as with many other such committees, from the beginning of 2015 when the levy was introduced, became fully funded by contributions to the levy of logs harvested. The committee meets quarterly and members include representatives from the major corporate foresters. Don Wallace, and more recently Michael Orchard represent small-scale forest growers. Like all the levy-funded committees, the Environment Committee has to compete for funds against the other committees such those involving research, fire, biosecurity and promotions. In 2017, the total budget allocated to the Environment Committee was just over $300,000. The Committee’s role is to develop policies on a wide range of issues relating to forest growing and the environment, including forest certification, climate change, water and the Resource Management Act. Current concerns include interpretation and implementation of the Resource Management Act, forest certification, the forest sink, compliance costs and power line corridor maintenance. How it deals with these issues, and their effect on small-scale forest growers is best illustrated by looking at some of the initiatives which it has been involved in. The National Environmental Standard for Plantation Forestry, the NES-PF, was initiated by corporate forest owners wanting to have a standard set of rules throughout New Zealand. Until now there have been no standard rules under the Resource Management Act for plantation forestry with each of the Territorial Local Authorities being free to set their own rules under the RMA for forestry and the severity of the rules varied markedly. In August 2017, the NES-PF was gazetted and from May 2018 it will set nationally consistent technical standards, methods or requirements relating to matters under the RMA and provide consistent rules across the country by setting planning requirements for certain specified activities. It prevails over district or regional plan rules except where it specifically allows more stringent plan rules. This has significant benefits for corporate foresters as they no longer have to negotiate and take court cases against multiple local authorities over the rules that they wish to impose on foresters. The result is not so clear for small-scale foresters. It will result in new rules regarding, for example, planting setbacks from boundaries and streams or construction of access tracks. These may cause problems and increase costs for those in areas that currently have more liberal rules. As members will be aware, some consumers of wood and paper and related materials are interested in where the product comes from and, in particular, that the trees which have been used in the manufacturing process have not been illegally logged. There are currently two certification systems used − the Forest Stewardship Council (FSC) and the Programme for the Endorsement of Forest Certification (PEFC). There are differences between the two systems, but both are used to certify wood grown in New Zealand. Most of the corporate foresters have integrated FSC into their business, but the costs associated with certification are too high for small foresters and few are certified. There is, however, a mechanism called ‘controlled wood’ whereby a certain percentage of wood from forests which have not been certified is allowed to be included with the wood from certified forests. It is through this mechanism that wood from small-scale forest growers can be included in the system. The three-yearly FSC General Assembly was in Canada in October this year. The NZFFA is a member of FSC but we could not justify the cost attending the meeting. We therefore relied on others members of the committee attending who had our proxy vote to represent our views on matters such as controlled wood and making FSC certification more cost-effective for small-scale foresters. This meeting was in progress as the Tree Grower went to press. Both the national (Transpower) and local (Lines Companies) power distribution companies are concerned about the problems caused when power lines are too close to trees. They have been asking for increases in clearance distances, usually without offering any compensation to land owners. It is only due to a united stand that foresters will be able to ensure that any solutions are fair to both sides. The Environment Committee has been working with Transpower and the Electricity Supply Association, which represents the local electricity lines companies, to try to get an equitable solution. There is no clear result yet but some work being done by Transpower, to replace rigid separation rules with a more flexible risk-based approach, has some promise. Many of the countries which accept our log exports insist that the logs are treated to kill pests before they arrive. To date, the usual way to do this is to treat the logs on the wharf by covering them with a tent-like structure and pumping in methyl bromide to kill the bugs. The tent is then opened and the remaining gas vented to the air. The committee has been working with Stimbr, the acronym for stakeholders in methyl bromide reduction, to identify a replacement treatment method. There are potential long-term alternatives to chemical treatment such as using electricity to heat logs, but none is likely to be commercially viable in the 2020 timeframe. The only effective and safe alternative to methyl bromide appears to be ethylene dinitrile or EDN. EDN is, apparently, almost completely absorbed by the logs and any remaining gas is less toxic that methyl bromide. Work is therefore proceeding with Stimbr to get EDN approved for use in New Zealand and to persuade the countries which receive our wood that EDN is as effective as methyl bromide as a phytosanitary measure. While we can come up with all kinds of measures to improve our environmental position, there is little point if the population at large is hostile to our efforts. This has led to significant efforts by Scion in an area called social licence to operate. ‘Social licence’ generally refers to a local community’s acceptance or approval of a company’s project or presence in an area. Fundamentally, it involves persuading ordinary people that forestry is good for them. The different levels of social licence are illustrated in the diagram below. Agreeing conditions for access to forests with the Walking Access Commission. As happens in any industry, the quality of forest engineering practice varies between companies carrying out harvesting and related work. Recently, the Environment Committee has been alerted to some examples of sub-standard practices which threaten the licence to operate work we are doing and are looking at ways to ensure that these are not repeated. Don Wallace is a member of the NZFFA Executive.